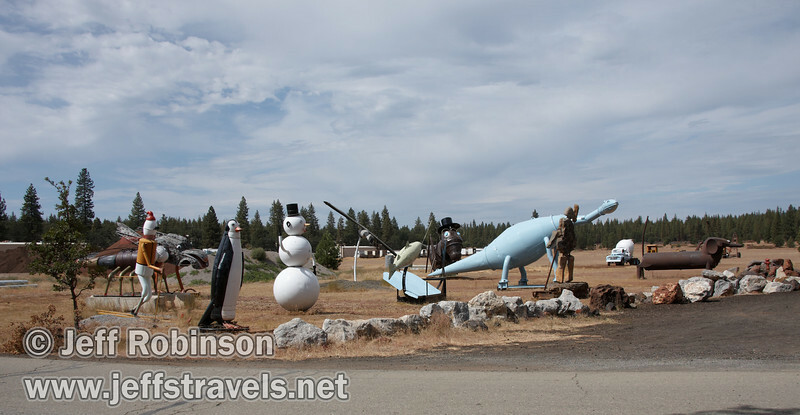 On our way to Crystal and Baum Lakes, we came across what I thought were some very cool metal sculptures. Someone at Packway Materials Inc. in Cassel, CA has made a bunch of large creatures out of scrap metal. For example, they have a dinosaur made out of a cement mixer drum, a chicken hawk made out of a VW bug, and a dragon fly with circular turbine vents for eyes. These are large sculptures (for example, I could easily walk underneath their ant). If you are near Burney and like stuff like this, definitely check them out. They are at 22246 Cassel Rd. in Cassel, CA.